Leaving Chefchaouen this morning, there was much concern about the weather, as the winds were howling, and the clouds were down low on the mountains, with some drizzle. Not good for walking the Roman ruins of Vilubilus, about 2 hours to the south. Fortunately, the further south we traveled, the weather improved. All along the way, lining the hillsides of the Rif Mountains, are olive trees, some citrus, and pomegranates. About an hour into our ride, our guide had the bus driver stop on the side of the road when he saw there was a man operating his olive press. Was I excited! Annie Mance, you would have loved it! 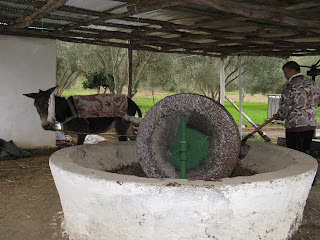 The man was leading a donkey, which was turning a huge stone wheel over a basin where the green and black olives were being squashed into a paste. From there, the paste is spread onto woven mats, about 18 inches in diameter, and then placed under a metal plate that screws down on top of it, squeezing the oil out; it drains into a holding tank, and presumably bottled from there. Only the first stage with the donkey was functioning when we pulled up. 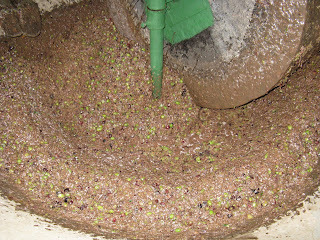 I asked, and it takes an hour and a half to crush the olives in that press; they were though, adding more olives to it as the olives got more and more crushed down. It takes 100 kilos of olives to make approximately 13 liters of oil. 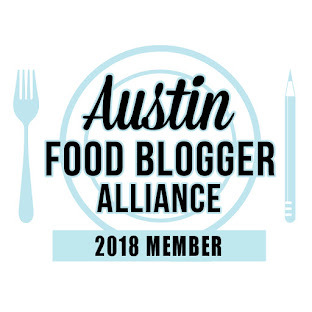 I also asked what kind of olives they were, and was told by our guide, “green and black.” When I further pressed the issue (no pun intended), I was still told, “just green and black.” Aside from the partial lack of info, it was great to see it! Unfortunately, there was no oil to sample. Another hour down the road took us to the town of Vilubilus, where we had lunch at a fancyish hotel that looked relatively new. They are obviously there for the tourist trade. Lunch was another plate of 4 cooked vegetables, and a mixed grill plate with sausages (the first I've seen in Morocco), a thin pork chop with the salt pork attached, chicken breast, and beef livers. The thin sausages were really good, certainly related to Spanish chorizo, as you could taste the smoked paprika in them. The pork chop wasn't bad (Muslim country, they don't eat much pork here), the chicken over cooked, and liver isn't my thing. Oh, and great bread there too; like a fat, more tender english muffin. 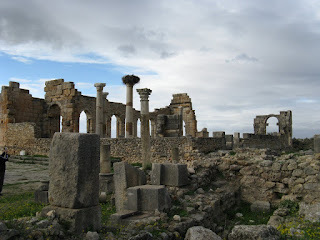 From there, it was a 5 minute drive down the road to the actual ruins of Vilubilus, which was the capitol of the Roman province of Mauritania, Rome's southwesternmost lands in Northern Africa. About 20,000 people lived in this valley 2000 years ago; the ruins are spread over 28 acres, and have some extremely well preserved mosaics of the era. Amongst the ruins are also over 50 olive presses, showing the importance of the oil even way back when. It was used for cooking, massage (they know which building was the town brothel and the public baths), and burning in oil lamps, as well as being sent back to Rome for use there. It was very windy while we were there, but it was an interesting lesson in the Roman Empire, and the views were beautiful. Back to the bus, and another hour and a half, we were at the Hotel Merinides in Fes, where there is wireless internet! The hotel has a fancy traditional (as in, for the tourists) dining room, which was rather ornate. Unfortunately, the traditional Moroccan meal didn't match the setting..... a reasonable hariah soup, though more tomato-based than what I've had in the past, an assortment of small meat phyllo-wrapped savory appetizers, and an alright beef tagine, but that's our third beef tagine in row, and certainly not the best! The end of the meal was accompanied by musicians playing traditional music, and the requisite belly dancer, who was quite good with the moves, but facially, didn't seem into it.